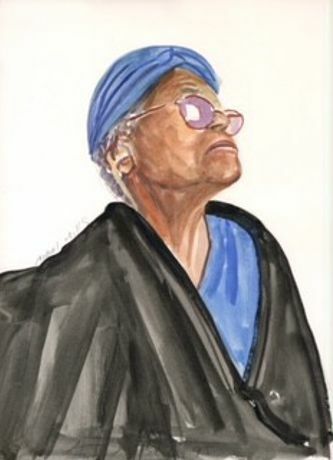 The Laurie M. Tisch Gallery is honored to present Brenda Zlamany: 100/100, an exhibit of 100 watercolor portraits of residents of the Hebrew Home at Riverdale. The exhibit, which features 100 portraits of residents of the Hebrew Home at Riverdale, honors overlooked members of society. Zlamany involved her subjects in an artistic process that upholds their value and displays the beauty and wisdom that come with age. 100/100 is the most recent chapter in Zlamany’s ongoing project, “The Itinerant Portraitist,” in which she explores the constructive effects of portraiture in communities around the globe. Previous chapters involved Aboriginal people in Taiwan, girls in an orphanage in the United Arab Emirates, artists in Brooklyn, and taxicab drivers in Cuba. Zlamany is a painter who lives in Brooklyn. Since 1982 her work has appeared in many solo and group exhibitions in the United States, Europe, Asia, and the Middle East. She has received a Fulbright Fellowship, a Pollock-Krasner Foundation grant, a New York Foundation for the Arts Artists’ Fellowship in painting, and a Jerome Foundation Fellowship. Yale University recently commissioned two large-scale group portraits by her for permanent public display on campus. Brenda Zlamany: 100/100 is part of Reimagine End of Life (letsreimagine.org). The exhibit originated during an artist’s residency at the Hebrew Home at Riverdale by RiverSpring Health in 2017 and was first presented at Derfner Judaica Museum + The Art Collection from Sep 10, 2017, to Jan 7, 2018. For more information, please visit letsreimagine.org.